A perfect combination. What's better than listen to your favorite tunes on a sunny day? This gadget stores music in various formats (MP3 / WMA / ADPCM). The earphones are built close to your ears, so there is no hassle of daggling wires around like other music players. We got the best lenses we could find to protect your eyes. This is, after all, a pair of sunglasses, and we wouldn't skimp on your eye protection. The dark pair of lenses are polarized (filter out glare), and with UV 400 protection. With the sunglasses, you can store up to 32 hours of music per GB, and can play back up to 8 hours per charge. The earphones we sourced are very high quality to ensure 3D sound effect. The voice recorder records up to 72 hours/GB of audio in ADPCM format with just a press of a button. The microphone is inconspicuously built. No one would ever know that you’re recording. It just fits. 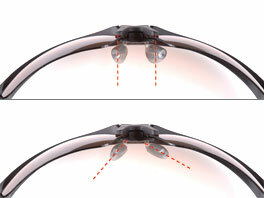 The patented adjustable nose pads allow you to adjust the them to your comfort. Just slightly press the frame against your face and the nose pads would turn to fit your nose contour - no tweezers needed, no worries that they might break.